DES's College of Engineering and Technology, Amravati has advertised in the LOKMAT newspaper for recruitment of Assistant Professor jobs vacancies. 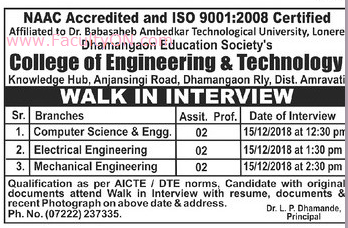 Interested and eligible job aspirants are requested to walk-in on 15th December 2018. Check out further more details below. About College : Having regard to the fact that education plays a key role in bringing up the social structure of the nation, late Shri Shrinarayanji Agrawal, a yogic man by practice known for his prudence, unparalleled devotion and dedication and above all, his simplicity sowed the seed of Dhamangaon Education Society way back in 1914. He was inspired in this endeavour by his contemporaries, late Shri Jamnalalji Bajaj and late Shri Shrikrishnadasji Jaju. D.E.S. thus perhaps happens to be the oldest and pioneering institution in the Vidarbha region rendering yeoman&s service to the cause of education in a small town of Dhamangaon and adjoining rural areas of Amravati district. Dhamangaon Education Society had the unique tradition of having presidents who had been the distinguished loyalists and idealists. They included Late Shri Bhagchandji Agrawal, Late Shri Dulichandji Agrawal, Late Shri Liladharji Bhutada, Late Shri Suganchandraji Lunawat, Late Shri Puroshattamdasji rathi, Late Shri Shubhakaranji Saraf, Late Shri Ranchoddasbhai Annam, and Late Shri Gajananji Agrawal. How to Apply: Interested and eligible candidates are required to attend the Walk-in interview by bringing their latest CV along with originals & copies of certificates and recent PP size photos to the walk-in address mentioned below.